You may be thinking, “Wait . . . Presbyterian Women is only 30?” Well, yes and no. Today’s Presbyterian Women organization was born in 1988. The Presbyterian Church in the United States and the United Presbyterian Church in the USA reunited in 1983; the women’s organizations in these two denomina-tions—Women of the Church and United Presbyterian Women, respectively—merged in 1988. But even those two predecessor organizations are only part of the story; the tradition of groups of Presbyterian women organizing has a more-than-200-year heritage. 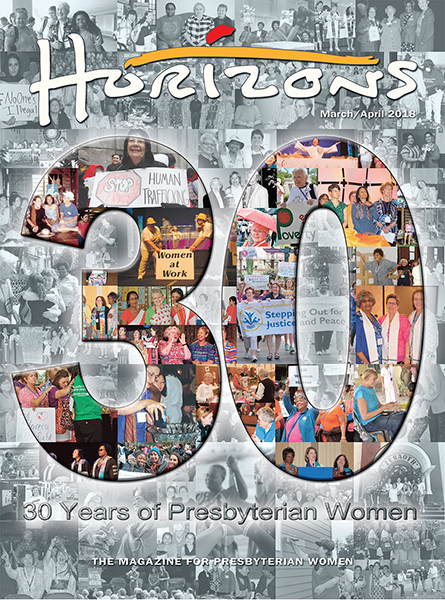 With that history revisited, let’s take this moment to celebrate 30 years of Presbyterian Women as we know it now. The following pages highlight just part of what PW has seeded and achieved since 1988. The articles and timelines show what happened in PW Churchwide, but, as we all know, our organization is so much more than that. It is amazingly rich and connectional, from the local PW group on up. 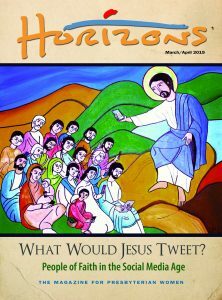 Whether you’re a PW in Abingdon Presbytery or in the Presbytery of the Yukon—or anywhere in between—you’ll find something in this issue that speaks to the committed ministry of your group. Some of the priorities and ideas started in circles have made their way to and been adopted by PW Churchwide. Members of Presbyterian Women’s Churchwide Coordinating Team (its national board) have taken some of these ideas back to their circles or PW in the Presbytery or PW in the Synod groups. 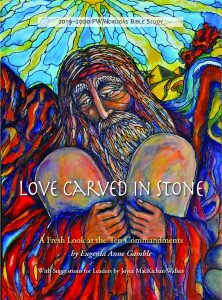 Other ideas were started at the Churchwide level, then found fertile ground in specific PW in the Congregation, Presbytery or Synod groups. All that to say, in the following pages, there’s a good chance you’ll see the seed, sapling or sequoia of a project that has a special place in your group’s mission. Today’s PW proudly continues the rich tradition of our predecessor organizations and the faithful women who made this world a better place for God’s people and all of God’s creation. Every time we give to a Thank or Birthday Offering, support a mission co-worker, add a penny to the Least Coin collection, attend a session meeting, participate in Bible study, stand in the pulpit or serve on a board, we have many sisters in faith to thank, and many in the future who will be grateful for our witness. Have a great story to share? Don’t keep your PW’s light under a bushel! Bring your story to life and light by sending it to sharon.gillies@pcusa.org or Sharon Dunne Gillies, 100 Witherspoon St., Louisville, KY 40202. Remember that we are connectional! Your flame of an idea or ministry may set aflame a ministry for another PW group. Yvonne Hileman shares the responses of PW’s Churchwide Moderators to questions about their experiences as moderator. They share the joys and challenges of leading a national and diverse organization, and their hopes for our beloved organization’s future. Throughout its 30-year history, Presbyterian Women has intentionally worked toward building an inclusive, caring community, particularly one that welcomes women of all racial-ethnic backgrounds. Learn about how the organization has sought out and celebrated gifts from racial ethnic women. Sharon Dunne Gillies details how the memoranda of understanding signed at the 2015 Churchwide Gathering have led to growing partnerships and shared ministry between Presbyterian Women and women’s organizations in the United States with roots in Presbyterian denominations from Cameroon, Ghana and Kenya. Answering the questions of many enthusiastic historians, Yvonne Hileman offers a brief history of Honorary Life Memberships and traces the program’s roots to traditions of PW’s predecessor organizations. Presbyterian Women has touched many hearts and many parts of the world in the last 30 years. Relive PW’s programs, leaders and events from that time with photos and snippets that highlight our witness in the world. Messengers of Faith for 30 Years and Counting!